After five years as a post-doctoral fellow at New York University, former Ottawa Heart Institute trainee Mireille Ouimet, PhD, has returned to the Institute to lead the new Cardiovascular Metabolism and Cell Biology Laboratory. Her team will focus on understanding how defects in a cellular process called autophagy contribute to the development of heart disease, and how the process might be manipulated to prevent or even reverse coronary artery disease—a major cause of heart attack. The Beat spoke with Dr. Ouimet about her plans in this emerging area of research. The Beat: What brought you to science as a career and to the Heart Institute as a researcher? Dr. Ouimet: I was always interested in biology. I thought that cells—and all of the mechanisms in place in the natural world to give order to everything—were just amazing. During my undergraduate studies I got interested in discovery science and did an undergraduate project in Yves Marcel’s lab at the Heart Institute, where I got really interested in studying heart disease and stayed on for my PhD. The Heart Institute is a really unique research centre, with many talented scientists and clinicians working together. It’s very collaborative. I get to go to seminars and learn about the clinical questions, and that makes me ask: What could I do to impact the treatment of patients on my end? 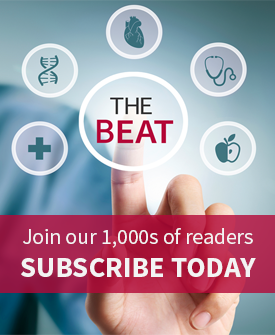 The Beat: What is autophagy, and why is it interesting to heart disease researchers? Dr. Ouimet: Autophagy is the way cells recycle their components. The process breaks proteins down into their amino acid elements and then re-uses them to build other molecules. The study of autophagy and heart disease is really in its infancy right now, but it’s very applicable. In heart disease, we see a build-up of cholesterol in the arteries, and so if we could harness this autophagy mechanism to break down those lipid droplets, it would be fantastic. And so we’re looking for ways to stimulate this process and at how we can target lipids in the arteries to be specifically degraded. The Beat: Last year, the Nobel Prize in Physiology or Medicine went to Yoshinori Ohsumi for his work in autophagy. Does his work have relevance to heart disease? Dr. Ouimet: Autophagy is an amazing process that we didn’t have the tools to study for the longest time. What Dr. Oshumi did is that he identified a lot of the molecular components of the pathway, a lot of the critical genes that are involved in the process. So now we have the tools to knock some of these genes out and specifically stop the process to understand what the consequences of that are in different diseases. The Beat: What does your new lab plan to focus on? Dr. Ouimet: We’re going to work out the molecular mechanisms driving the breakdown of lipid droplets in the arteries through autophagy. Lipid accumulation is the root of coronary artery disease. So if we can limit or even reverse that accumulation by stimulating autophagy and targeting the lipid droplets for breakdown, then we could potentially treat heart disease. In order to do that, we need to understand how the process is happening, and right now we don’t actually understand any of it. We know that it becomes dysregulated during heart disease development. But what leads to this dysfunction is currently unknown. And what proteins we could use as markers of this dysregulation is not known. If we can understand how autophagy normally works in the arteries, that could lead to the identification of novel biomarkers of heart disease and potentially novel therapeutics for treatment of heart disease. I think this is a new avenue of research that is highly promising.